When you have the right branding components in place, you make it clear and easy for those that truly need your services or products to reach into their pockets and work with you. Naming – When You Aim for the Best Name you set the best foundation. In this worksheet I show you how to get your naming right and make sure it can go global before you invest your time and energy into it. We’ll check meanings, pronunciations, appropriateness and cultural acceptance. Messaging – When you Get To The Heart of Your Message and express your values and abilities, you attracts others to you in full integrity. This worksheet is a few pages and we outline your values so that you can communicate the right words to the right people. I list 140 values that you can choose from to make it easy for you. Positioning – By Positioning Yourself as an Approachable Leader you cast a wide net that serves more people than you alone can handle, unleashing your talent across the globe. You know I’ve been quoted in the media and interviewed on TV. I list my sources for connecting with journalists and positioning yourself as an expert advisor. Most of this resource stuff won’t cost you a penny, as well. Signals – Signals That Support Your Brand are often the first impression of your brand. They need to stand out, be strong and fill in the holes when you’re not around. This worksheet guides you through the different components of your brand and even if you already have them in place, we’ll rate them to see where you need to improve. Experience – To keep client referrals rolling in and your current clients coming back you must give them an exciting experience. Making your service tangible does just that! You hear a lot about building a welcome kit right? I actually tell you how to do it, and how to build a “thank you” kit that keeps your clients coming back. Management – To reach your full potential you need systems in place to manage your team and market your business processes. No business should be without a Brand Management Program! What is it? It’s all the stuff that needs to happen to keep you visible and profitable. Part of that is knowing where your traffic is coming from and where people are lingering. See how to develop that with this sheet. 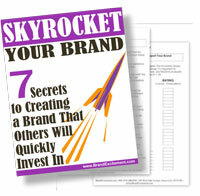 What great tips and ideas you have to give for branding! Thank you for sharing your expertise! Wow! Where have you been all my entrepreneurial life? I still struggle with understanding branding, even tho I have been in several business building programs. Guess I need to hear it in language I could relate to. Thanks Beatrice! You make the process simple. Appreciate the download. This is helpful for creating our branding worksheets! Thank you very much for sharing your ideas – a much appreciated download! Your welcome Eva. Let me know how they work out for you!